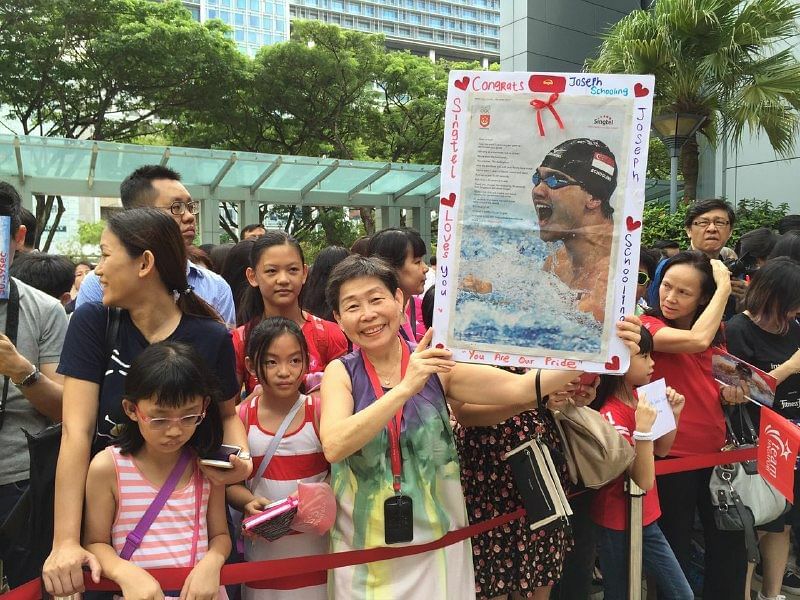 Schooling and working took a backseat as Singaporeans of all ages and races lined the streets to give Olympic gold medallist Joseph Schooling a hero's farewell during his 3-stop victory parade. 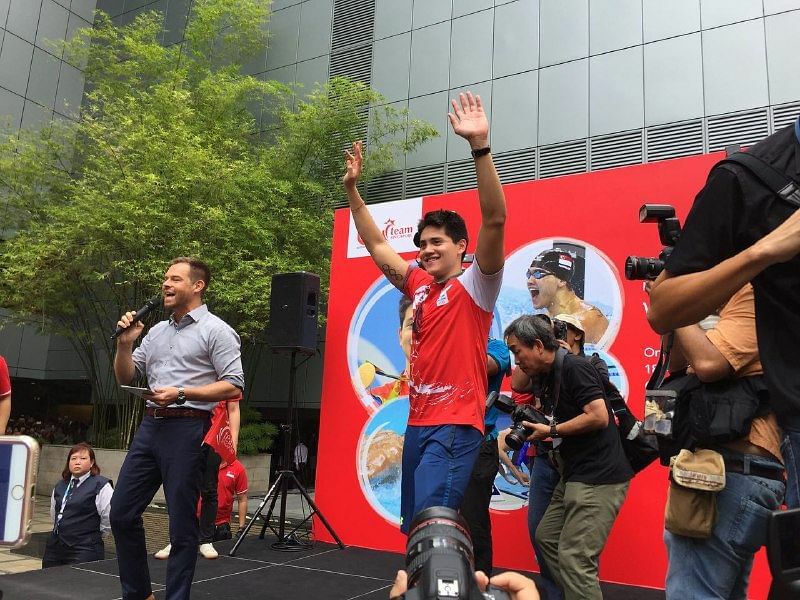 SINGAPORE - From the HDB estate in Marine Parade to the glitzy shopping belt in the city, thousands lined the streets to give Singapore's first Olympic champion Joseph Schooling a rousing send-off on Thursday (Aug 18). Schooling, 21, waved to the crowd and said "thank you" as he rode on a red open-top bus in a three-hour journey which took him from Marine Terrace Market to Singtel Comcentre and finally to Raffles City Shopping Centre. He was joined by parents Colin and May, as well as national swimmer and good friend Teo Zhen Ren. 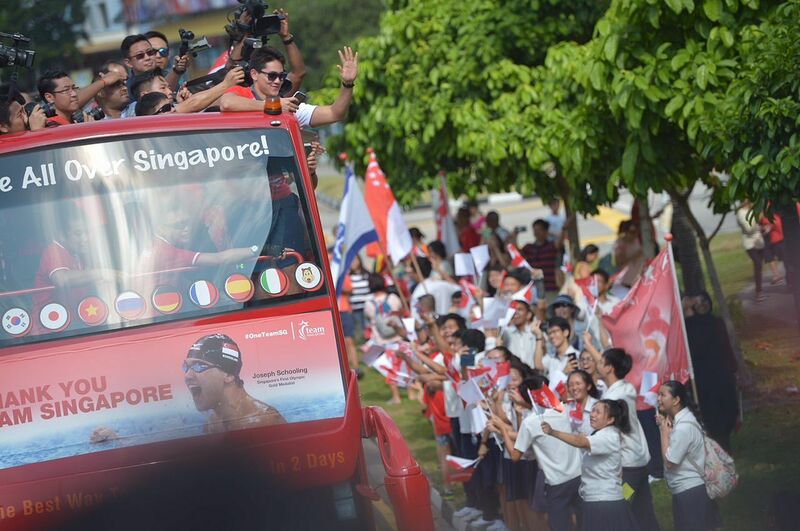 The victory parade started at 9.50am at the Singapore Sports Hub, scene of Schooling's nine-gold outing at last year's Singapore SEA Games. He reached Raffles City Shopping Centre - the last stop - close to 1pm. Along the way, fans - from young children, students, working adults to retirees - made clear their appreciation for the swimmer who bested United States legend Michael Phelps to win the Olympics 100m butterfly final - in an Olympic record time of 50.39sec. Some held up placards and posters of the swimmer, and one fan even tossed a stuffed toy in the air - which Schooling managed to catch from the open-top deck of the bus. In return, Singapore's golden boy, looking fresh and relaxed, waved enthusiastically to the crowd throughout the ride - even along a stretch where there were few people - and said "thank you" repeatedly. At one point, a lucky driver who happened to stop next to the bus at a traffic junction rolled down his car window to wave to Schooling, who replied "thank you, uncle". Amid the frenzy, two accidents occurred along the way. One car grazed the side of Schooling's bus as the driver and passengers waved to him, while another failed to brake in time and collided with a car in front of it. At each stop, Schooling stepped out to sign autographs and interact with fans. His security team had to be on high alert as fans forced markers and memorabilia at the swimmer. Each school that the parade passed, including Dunman High School, Tanjong Katong Girls' School and the Canadian School, staff and students - chanting "Schooling, Schooling" - lined the road to welcome their idol. 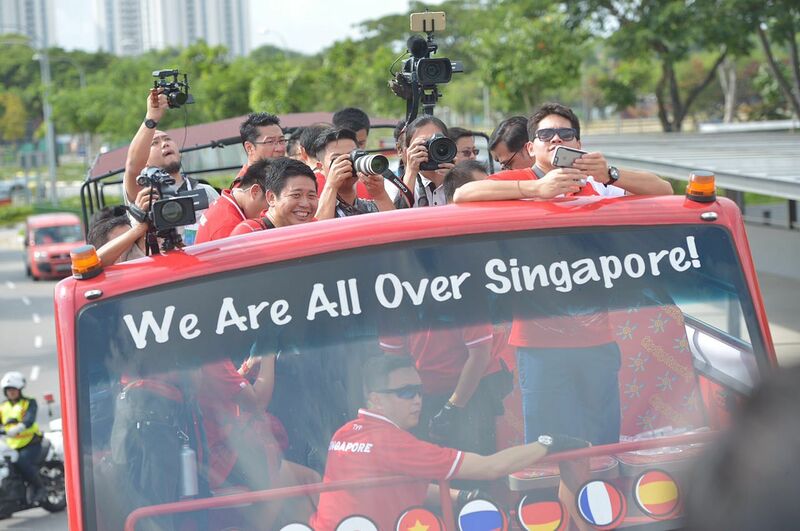 Cars along Old Airport Road honked as the crowd cheered and chanted “Singapore, Singapore!”. Overhead bridges along the route were also filled with fans eager to catch a glimpse of the swim star. 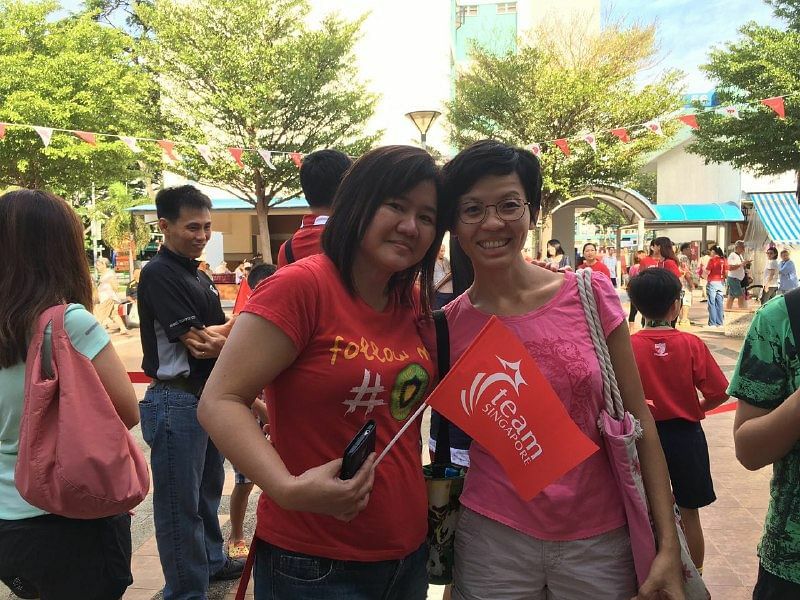 At the first pit stop at Marine Terrace, fans had gathered there from as early as 8.30am. "We live nearby and come to the market often and knew he was coming and decided to queue. We hope to get his autograph and a picture with him," said housewife Ivy Yee, who came with a friend. 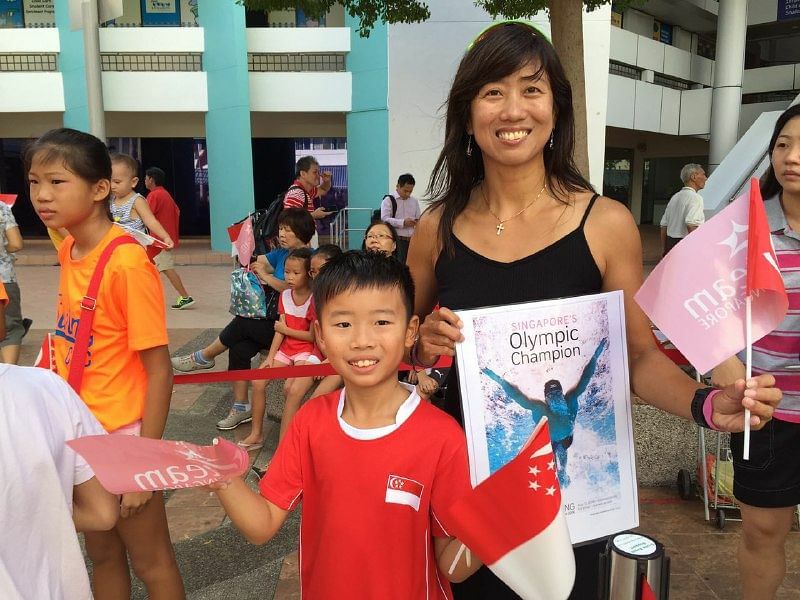 Ms Rachel Charis Ng, 50, said: "We have been big fans of Joseph Schooling since the SEA Games last year. We've watched his every event since then. We came at 8.30am to queue and want to get a picture and his autograph." She came with her son Samuel, eight, who is in the Chinese Swimming Club. He skipped training so he could be there to meet Schooling. 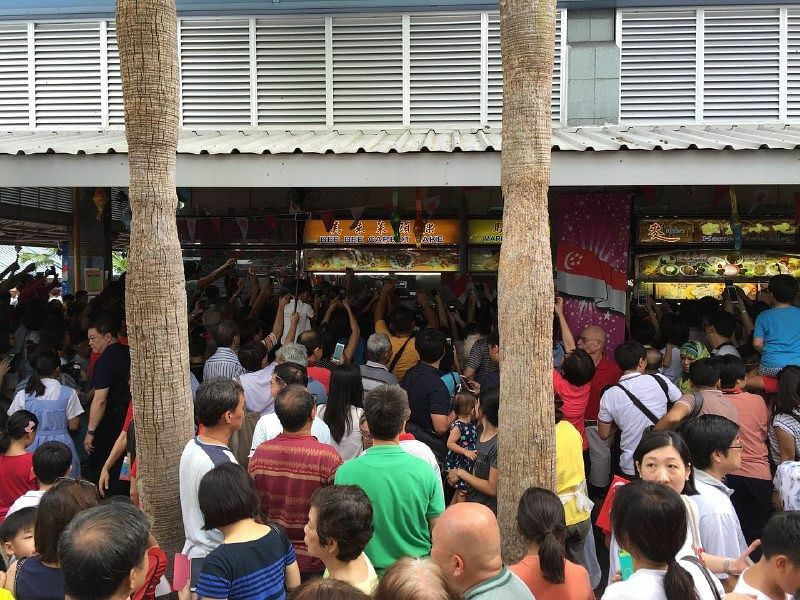 By 9am, the queue had grown to at least 400 people and had extended to the neighbouring HDB blocks. By the time the bus arrived at Marine Terrace at 10.30am, the area was jam-packed with hundreds of people who mobbed Schooling as he tried to make his way through. Excited kindergarten children were cheering "Schooling, Schooling!". They swarmed the bus as it arrived, delaying Schooling's entrance. He stepped out of the bus after almost 10 minutes as the crowd erupted in pandemonium. 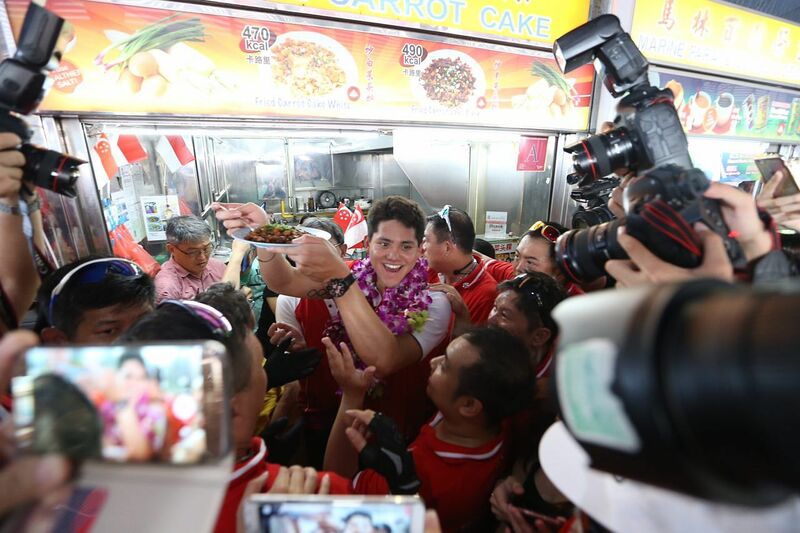 The crowd continued to cheer and follow him as Schooling made his way to hawker stall Bee Bee Carrot Cake for his favourite dish - chye tow kueh, or fried carrot cake. After savouring the local delight, Schooling told the crowd: "Thank you for coming out here and waiting so long, I love you guys." 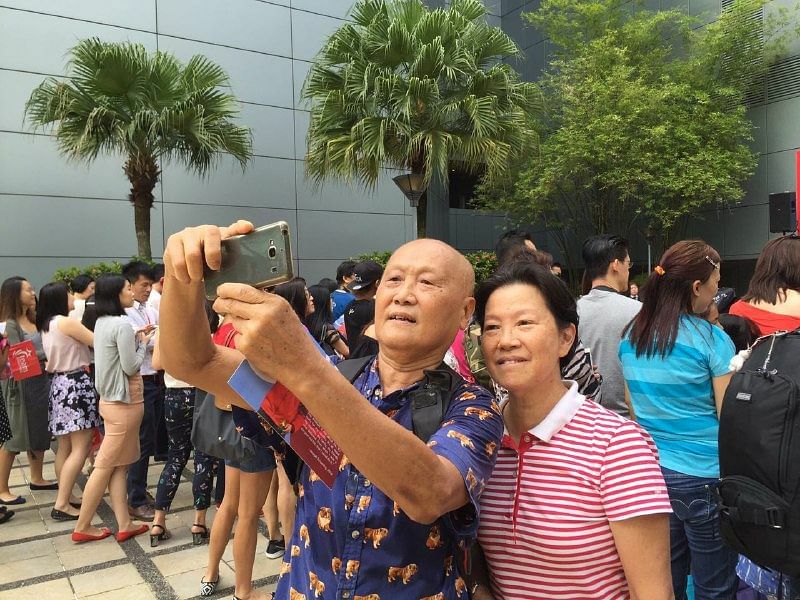 At Singtel Comcentre Plaza, the second pit stop, grandparents Paul and Mary were taking a selfie as they awaited Schooling's arrival. “We’re so happy to be here, it's such a privilege. It's such a Singapore moment!" they said. "Kudos go to his parents - his mum and dad have made sacrifices. As parents, we know it's not easy." He added: “It's hard for the private life, but I didn't do this for myself. I did it for my country, my family, my friends." He also took some questions from the emcee, including what his favourite English Premier League team was. For the record, it is Chelsea. 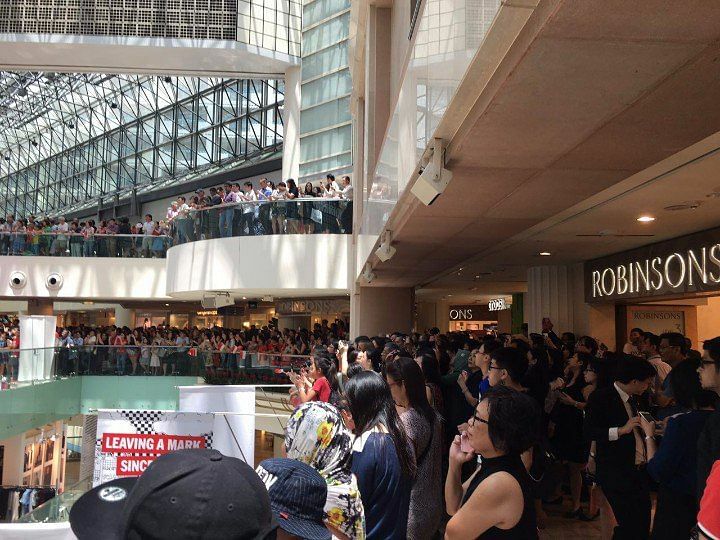 The parade wrapped up at the atrium on the third storey of Raffles City Shopping Centre, where fans and Schooling watched a repeat telecast of his historic race. They also belted out the national anthem during the victory ceremony. CHIJ St Theresa's Convent students Tay Sze Ting and Nadya Allysha, both 16, came straight from school after sitting their maths prelim exams. Even though the paper was tough, they kept their spirits up because they knew they would meet Schooling. “We’re getting him to sign our maths paper,” said Sze Ting. Retiree Jennifer Kang, 61, had gone to Marine Terrace in the morning but found it too crowded. So she came to Raffles City instead. "When I went there, I saw that I had no chance, so I rushed down here. I was so worried I would be late for here too," she said. Addressing the crowd, Schooling said: "Dream big, never give up, and keep fighting no matter what." The parade rounded up the butterfly king's homecoming. He had arrived on Monday, just two days after winning gold. 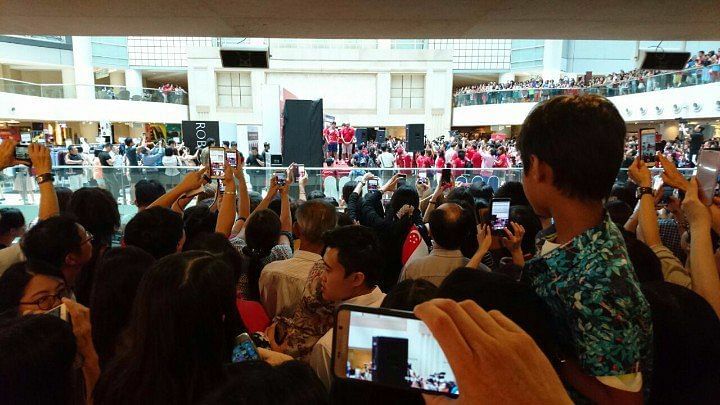 At Changi Airport, more than 500 fans welcomed him home. That afternoon, he went to Parliament, where the House gave him a standing ovation and formally recognised his achievements. During his stay, he also visited his alma mater, Anglo-Chinese School (Junior) at Winstedt Road, on Tuesday, where more than 1,600 pupils gave him a rousing reception. Wednesday saw Schooling take a break from media engagements, as he met family and friends for a function at Tanah Merah Country Club. He also visited former President S R Nathan at Singapore General Hospital. Mr Nathan, Singapore's sixth and longest-serving president, is in the hospital's intensive care unit after suffering a stroke last month. Schooling, who is studying at the University of Texas, will return to the US early on Friday morning. No send-off ceremony is planned as he will be leaving from Changi's private CIP Terminal.